Unfortunately we do not offer free shipping, but we do value you as a customer and appreciate your business! Most of the time our pricing is the best in the industry even after shipping costs are added in. Sometimes we can be beat; when this happens we hope that our extremely fast shipping and excellent customer service will make up for the difference. Use our cool shipping calculator to see the exact shipping costs to your location! Visit our Get Shipping Costs page to learn more! Yes, discount pricing is built into almost every product on our website through "tiered pricing". Therefore, the more you buy, the more you save (in most cases)! 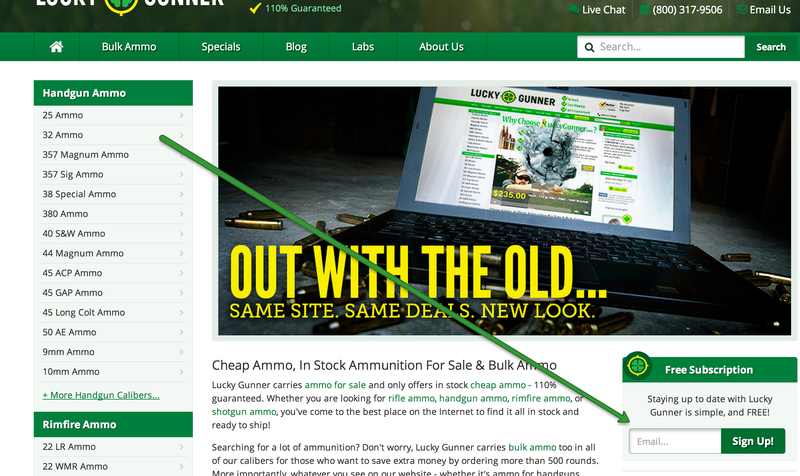 To learn more and watch a video describing our discount pricing visit our Bulk Ammo page. Also, be sure to search our Specials to take advantage of our weekly specials! Beyond these discounts, we are not currently offering any discount codes to our new customers, but we periodically offer discount codes to our returning customers! Make sure to sign up for our weekly newsletter to receive updates on new products and deals- the sign up is location on the right–hand side of our home page pictured below! Can I pay with 2 separate payment methods for 1 order? Unfortunately at this time we are not able to take multiple forms of payment for the same order. However, you can use both a credit card and a gift card with one order. You are welcome to purchase a gift card with one form of payment and use your gift card along with your second form of payment to make your purchase. To purchase a Gift Card, visit our Gift Card page and click on the “Buy Now” button. Alternatively, you are welcome to place multiple orders and use a different form of payment for each order. Can I pick my order up at the warehouse? Unfortunately, we are not set up to accommodate pickups at our warehouse. The only way to receive an order from us is to have it shipped to your location. Visit our Get Shipping Costs page to learn more. On the day your order is scheduled to ship, you will receive an e-mail from our office containing the tracking number(s) for your order. Your tracking number may not work, however, until UPS or FedEx scans your product into their system, but don’t worry… simply check again after 8PM EST when our last scheduled pick-up from our carriers takes place. Visit Get My Tracking Number to get your tracking number and track your order in seconds!